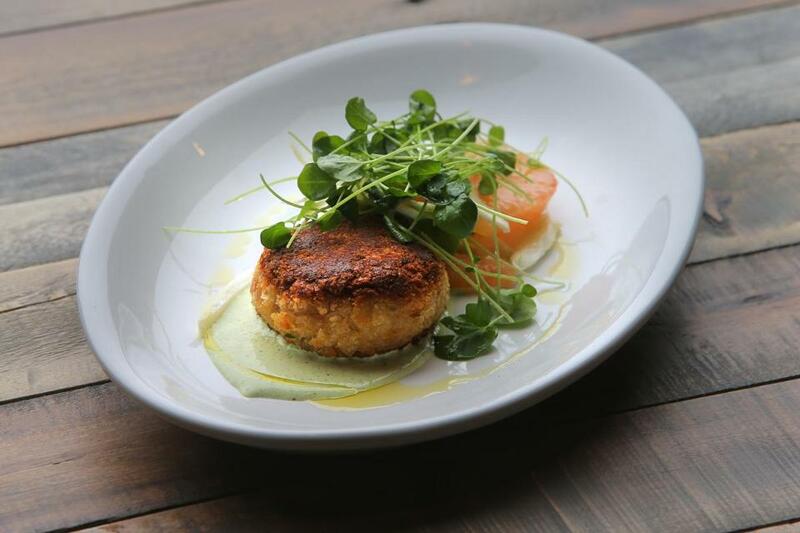 On the Commonwealth menu, a crab cake starter with microgreens, green goddess dressing and grapefruit. The days of mystery are over. We research one another online before the first date. We cohabit before we commit. We read spoiler alerts, listen to tracks before purchasing, pore over reviews of products we might want to buy. And when was the last time anyone walked into a restaurant not knowing what was on the menu? 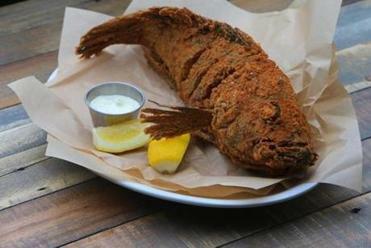 Commonwealth, opened in November in Kendall Square, takes this to a new level. Chef-owner Steve “Nookie” Postal, former Fenway Park executive chef and star of Bravo’s “Around the World in 80 Plates,” chronicled its opening for the website Eater. Never mind the menu. We arrive knowing about the staff, the Kickstarter campaign that helped finance the restaurant, the construction issues, even the brand of the urinals. And we feel we know Postal himself, a little bit — a funny, self-effacing guy in a high-anxiety business. The fourth wall is not just broken, it’s gone, replaced by recycled wood pallets we saw being nailed into place weeks before opening. This is the modern dining experience. It trades illusion for intimacy. It suits Commonwealth, where the food has nothing to hide. It’s what might happen if a chef who learned his trade at Oleana, as Postal did, took over Boston Market. The meal begins with a version of Parker House rolls, golden-topped, served with good butter. Then on to starters, each a pastiche of local, seasonal ingredients. There are raw oysters, briny and cold, seven varieties on offer. One salad combines beets and Vermont goat cheese, the old standby made new again with the addition of pistachio pesto, a little bit bright, a little bit rich. Another features romaine lettuce, feta cheese, olives, cucumbers, and earthy red quinoa. The flavors and crunch are refreshing, and the salads set the stage. This is clean, simple fare. And so crab cakes showcase crab rather than filling, plump and sweet beside segments of red grapefruit, topped with microgreens and accompanied by green goddess dressing. Rhode Island squid tastes perfectly fresh, lightly grilled and accompanied by prosciutto, escarole, and pickled pears — salty, sweet, sour, spiced. The rest of the meal is a la carte: Choose meat or fish, then add vegetables and starch as desired. The clear highlight is a whole black bass, fried so that the outside is crisp, greaseless, and nut brown, the meat still magically moist. The presentation is as impressive as the preparation: This is a fish in its glory, eyes, tail, fins, bones, and all. Also impressive is a pork chop for two, the meat rosy at the center, cut into slices. It is perfectly cooked. Indeed, just about everything here is, from venison to half a roast chicken to skirt steak to a wonderfully tender, flavorful short rib. At its best, this approach highlights the primal pleasure of a hunk of meat. Then again, one has to be in the mood for a hunk of meat. There is no elegant pasta dish, no clever vegetarian entree to mix things up. Variety comes on the side, and it is possible to eat as virtuously or decadently as one wishes. Vegetables are lovely: carrots in rainbow shades, Brussels sprouts browned on the edges and tender within, black kale and sweet little turnips and mushrooms of substance. 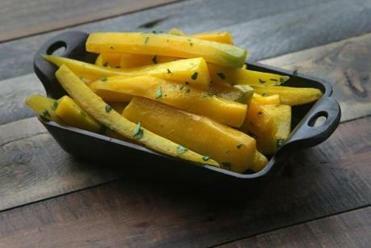 Flaky biscuits are enriched with chicken fat, fries sizzled in duck fat. Arriving at the table, a skillet of macaroni and cheese prompts sounds of approval and copycat orders. It looks like a gooey deep-dish pie; its flavor could be a bit more assertive. Risotto is formed into rounds and fried, crisp outside and creamy within. Commonwealth’s menu works wonderfully for large groups. It is less effective for small parties. With swordfish or steak, one wants multiple sides. Here, portions are generous and perfect for sharing, but each option is $9. Ordering a protein, a vegetable, and a starch when dining solo means a chicken dinner can cost almost $40, albeit with plenty of leftovers to take home. The clean simplicity of the food makes Commonwealth a natural for regular dinners. But its price tag won’t always work for that. Crispy whole black bass is magically moist inside. The restaurant serves lunch, too, with an array of sandwiches from pork belly banh mi to grilled portobello mushroom. And Commonwealth is also a market, selling eggs and milk, handmade jams and ice cream. A takeout counter offers daily dinners — meatloaf, fried chicken, tacos — at $16 to $18, served with two sides. These meals feel more accessible for everyday consumption. Where the a la carte approach works brilliantly is with dessert. Meals couldn’t end on a happier note than they do at Commonwealth, with an ice cream party every night. Choose a flavor from a list of 10 or so, from classic vanilla bean to a chocolate-bourbon one ought to be carded for. Eat it solo or pair it with an array of baked goods, sauces, and toppings. Spicy chai ice cream with apple doughnuts and salted caramel? A root beer float? Peppermint with cocoa nib magic shell and house-made fluff? Dare to dream. The good humor continues on the cocktail menu, with well-made classics, “cheesy” drinks like the Sea Breeze and Appletini, a punch of the day, and originals with names like Stranger Danger. The Nookie is an excellent, smooth riff on the Manhattan, with maple thrown in for good measure. Or pick the “Roll the Dice” option: “You choose the booze, we make the drink in a special glass.” Who can resist a special glass? 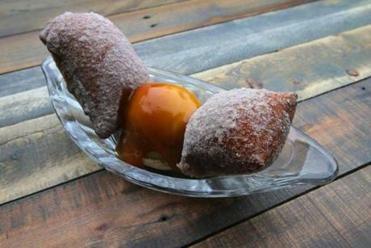 Apple doughnuts with ice cream and salted caramel. The festive spirit carries over to Sundays with the so-called Marky Mark & the Funky Brunch, an all-day affair with $1 oysters, Nutella and banana French toast, fried chicken with biscuits and gravy, and music from the ’80s and ’90s. The space is vast and stylish, equal parts rustic and industrial. Those wood pallets on the wall, along with exposed brick, feel both raw and warm; there’s a copper bar, an open kitchen, vintage signs, and repurposed school chairs. Servers are occasionally sassy and always attentive. The restaurant is well designed and well run. The food is well prepared. But it is Commonwealth’s personality that will keep people coming back.